Two weeks ago, I made an arrangement to meet with my sister in Alabang today. To the text message, I almost absent-mindedly appended, ‘weather permitting.’ Of course, at the time, I had absolutely no idea how prophetic the additional phrase would become. I was not too alarmed. Yellow in PAGASA’s color coding is no real cause for alarm, Red and black are. I was reasonably certain that that lump would have passed over with plenty of time to spare for my morning trip. As for Maring, it was nowhere even near the neighbourhood. It’s way up north in the Batanes area on the fringes of the Philippine Area of Responsibility or the PAR. But it has been sucking in the monsoon since yesterday afternoon like a whore. Funny how you tend to remember the time with clarity when something unusual happens. 5:36 was the time when I was awakened by loud thunderclaps early this morning. I had my alarm set for 6:30 the night before but the thunderclaps had beaten it. I groggily got up to check the time. These were not normal thunderclaps. They were, like, bombs exploding in the air! A morning thunderstorm is not unheard of; but the one that woke me up this morning was the sort we usually get in the heat of late April or May when the seasons begin to change. To say that it was effing loud is an understatement. Not only that. The rain that was splattering on the roofs around the neighbourhood was not even the proverbial cats and dogs. More like elephants and rhinos. I immediately knew that I was not going to Alabang. The weather did not permit it. By some miracle I managed to go back to sleep, albeit fitfully. When I finally got up two hours later, you guessed it – it was still raining. And it rained and it rained and it rained, on through the morning and into the afternoon. So this was how Noah felt. Dreadful. Days like this, you can always trust people to come to Facebook to let you know what’s going on elsewhere. Was I ever so thankful that I was not foolhardy enough to actually take a bus to Alabang despite the weather. 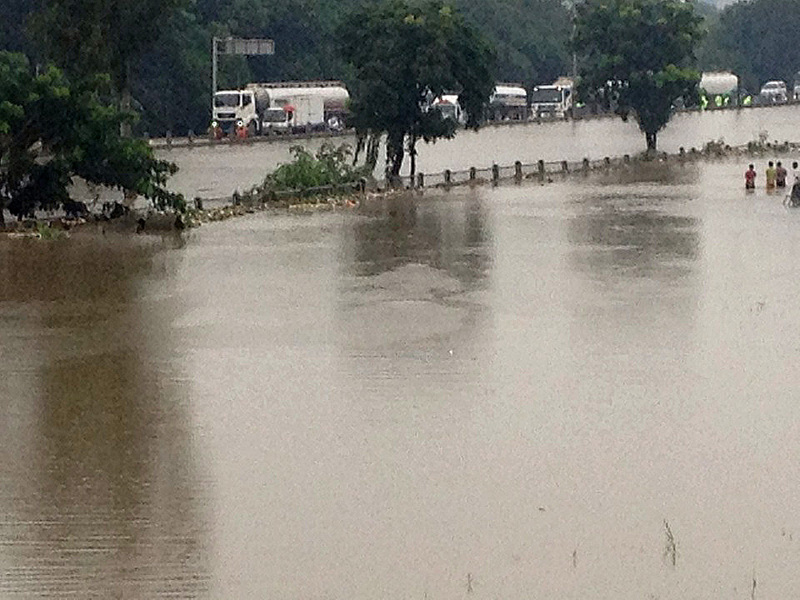 There is this stretch of the SLEX near Southwoods that is always susceptible to flooding. 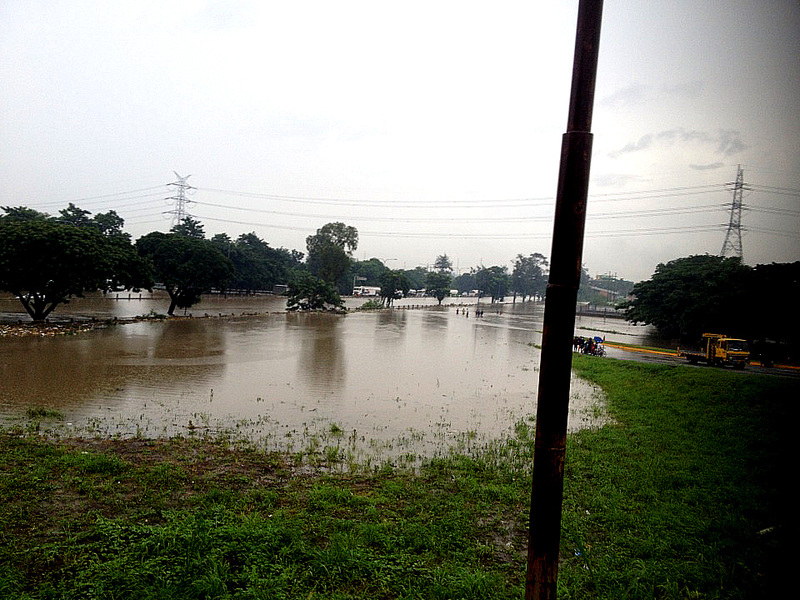 It was here where traffic ground to a halt because of Ondoy a few years back. Not surprisingly, it was flooded again this morning. 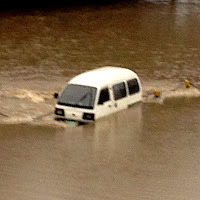 Before long, people were posting images on Facebook of the flash flood in the area, some vehicles unlucky enough to be caught right in the middle of it and the traffic that, like during Ondoy, had ground to a halt. And I would have been among those worried, hungry and holding my pee in had I gotten onto a bus for Alabang. Sometimes, it pays to be lazy. But it was not only along SLEX that was flooded. 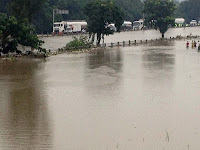 On Facebook, people had also posted pictures of flooding right here in Lipa, can you bleeding believe that? 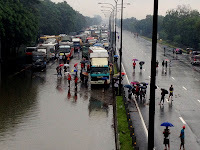 When I was a boy, one of my grandfathers had opined that the day Lipa gets flooded by even an inch, Manila would have vanished from the face of God’s earth. Well, that’s an exaggeration of course; but also in recognition of Lipa’s location a thousand feet above sea level. Let’s just say that I was not too surprised that the pictures people posted were of that area in front of McDo and Robinson’s place which is a natural catchment for water pouring in from the poblacion, from San Carlos and from Paninsingin. 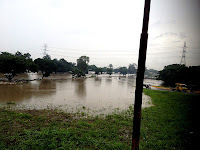 The one thing that we who live in Lipa can always thank the Lord and all the saints for is that even when there is flooding, you know that as long as the rains stop, the flooding will soon ease away to find lower land. Sad to say, others will not be so lucky. I was monitoring DZMM teleradio in the morning and the mayors of San Pedro, Sta. Rosa and Biñan in Laguna were frustrated by their inability to fully implement rescue and relocation operations because the floodwaters were rampaging through streets in dangerous currents. 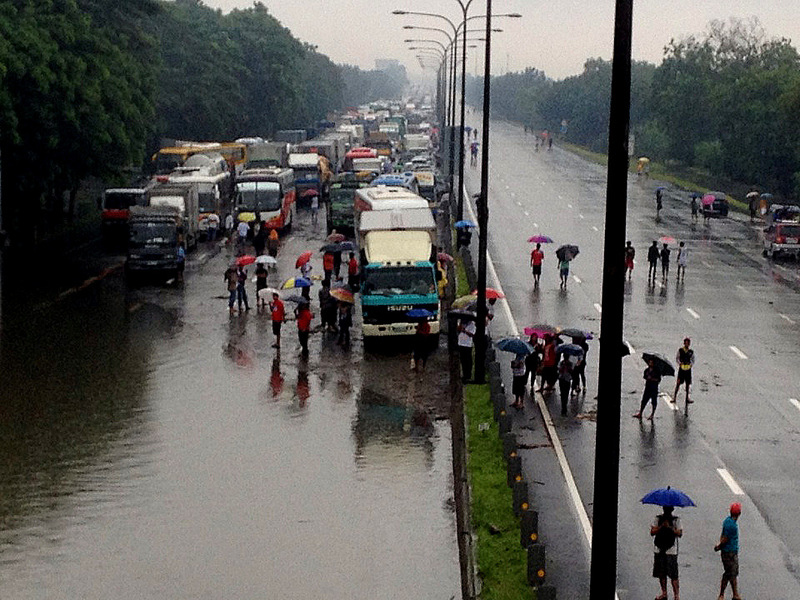 Because of the volume of water that rained down from the heavens, naturally, portions of Metro Manila were inundated by floodwaters. But then again, in Metro Manila what will be unusual is if there are no floods when it rains as hard and as long as it did today. And that is why, for most of the morning, it felt like the entire Pacific Ocean was being dumped upon us. The amount of rains that fell today was just simply ridiculous! Acknowledgment: Photos by Danny Delgado.